An area of 40 square kilometres of palaces and monasteries and is one of the holiest places in Sri Lanka as the Sacred Bo Tree is visited by many pilgrims. The three most important ancient monastery complexes are The Mahavihara (3rd century BC), The Abhayagini (89 – 77 BC) and The Jetavana Vihara (4th century AD). There is a National Museum for Archaeology and a Folk Art Museum. 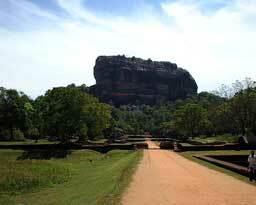 Dating from 470 AD and built by King Kasiappa is 200 metres high. 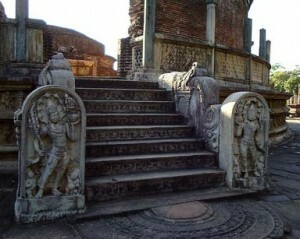 A staircase takes you to a cave gallery containing frescoes of famous Sigiriya maidens. From the top of the rock are spectacular views of the distant hills and jungle. The site also features a moat and water gardens. Golden Cave Temples, there are 5 cave temples containing over 150 Buddhist images and paintings which date back 2000 years. Ancient city and World Heritage site built in 11th & 12th centuries AD. You can see colossal Buddha images carved on the face of the granite boulder of Gal Vihara.